A recent Newspoll study shows that many of the myths surrounding dandruff are still hovering in the back of the minds of many Australians1. It was revealed that 1 in 2 Australians think that if you have dry skin you will get dandruff, while over 2 million Australians would not date someone with dandruff. No wonder there are so many singles out there considering that around half the population suffers from dandruff and its related symptoms at some stage in their lives! Head & Shoulders have introduced a new era in Anti-Dandruff solutions that can help to ensure there are more healthy scalps across the nation who can now be moved into the eligible stakes. The new Intensive Solutions range contains 2% of the active ingredient Zinc Pyrithione (ZPT), and the new formulation provides efficacy not seen before in Head & Shoulders Shampoo. Celebrity stylist, Sophie Roberts says, "Its amazing how many of my clients experience dandruff from time to time, and theyre all quite self conscious about it. I always recommend Head & Shoulders, as it not only keeps the signs of dandruff under control but also gives the benefits of a regular shampoo, delivering beautiful, conditioned hair." "Although it may sound like a harsh shampoo, the new Intensive Solutions range actually has a great conditioning formula and when used with one of the regular Head & Shoulders conditioners, will give you great results - plus help get your confidence back!" said Sophie. An additional survey conducted amongst dermatologists following the preview of Intensive Solutions at the International Academy of Cosmetic Dermatology Congress in 2006, found that 8 out of 10 dermatologists surveyed would recommend Head & Shoulders Intensive Solutions to their patients2. In clinical studies of new Intensive Solutions, it was found that of subjects with the most severe form of dandruff, 87% showed a significant reduction in flaking in three weeks3. The launch of new Intensive Solutions shampoos continues to place Head & Shoulders at the forefront of anti dandruff technology. Intensive Solutions will be available in two variants; for normal hair and for dry/damaged hair. The new range not only offers excellent dandruff control but also gives you the benefits of a regular shampoo with the best ever H&S hair and scalp conditioning and moisturising formulation, invigorating fragrance and great new look pack. 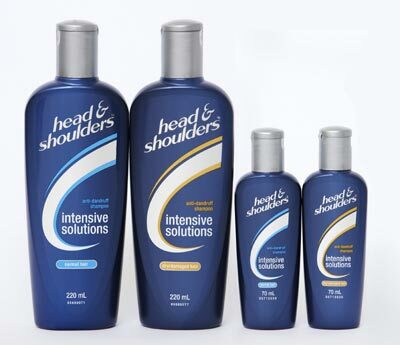 The new Head & Shoulders Intensive Solutions range is now available from supermarkets and selected pharmacies. 1 This Newspoll study was conducted by telephone in March 2007 among a representative sample of 1201 adults aged 18+ nationally.